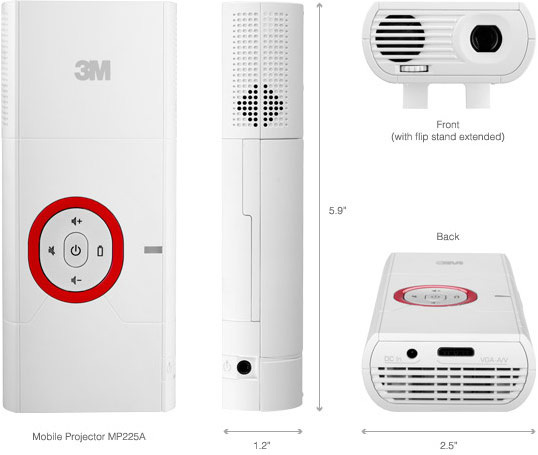 A new mobile projector developed for iOS devices like the Apple iPhone 4S and the iPad 3 has been turning heads this month. The gadget has been created by 3M and it allows users to plug in their smartphone, media player or tablet and enjoy big screen thrills from a small screen device. The MP225a takes into account Apple’s proprietary connection which is used by most iOS devices and so it is even be compatible with the iPod Touch family. An internal Li-Ion battery can deliver up to two hours of projection from a three hour charging period, which is long enough to watch most movies in one sitting. Of course the projector really flourishes when it is taken out and about. Since it measures just six inches long it is easy enough to slip it into a bag or pocket alongside your iOS device and then charge it later when you reach your destination. The projector can generate 32 lumens of brightness thanks to its integrated LED lighting. This may seem low by the standards of full size desktop projectors. However, compared to many other mini portable projectors it is admirable. The manufacturer says that the efficient LED technology should allow the device to operate for 20,000 hours or so, which means you should not need to rush out and buy a new one any time soon. In terms of picture quality the 800×600 resolution kicked out by the MP225a is excellent and it is rated to work best when projecting screen sizes of between 10 and 80 inches. In independent tests it has been able to achieve solid picture quality when operating over 120 inches, so you can really experiment and see where the limits of the device actually lie. The process of linking the projector to your iPhone or other Apple gadget is easy and the iOS device will recognize that it has been connected to an external display in a jiffy. You can then play back any content or use any service you see fit, enjoying the fact that it is being blown up to a far larger size than is possible on the gadget itself. You could have an impromptu movie night in a place with no other audiovisual equipment. You could conduct a presentation on the spur of the moment or if the power is out. You could get rid of that TV wall mount bracket or Plasma Wall Mount and project things at home. This device will please Apple fans immensely.